Atomic Clocks set themselves by listening for the radio signals of the NIST Atomic Clock in Fort Collins, Colorado. As soon as the Atomic Clock caches the signal, the hands will spin at 20 times their normal rate and the time is adjusted to accuracy with less than a one-second deviation in one million years! These atomic clocks regulates the WWVB radio transmitter where the exact time signal is continuously broadcast throughout the United States at 60 kHz to take advantage of stable long wave radio paths found in that frequency range. 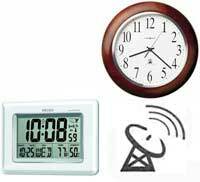 Atomic, Radio Controlled clocks will receive the signal (usually at night) and make corrections to automatically keep the clock correct. They will adjust for daylight saving time. If you lost your instructions and are trying to set your atomic clock, please read our atomic wall clock operations guide for atomic clock with hands. 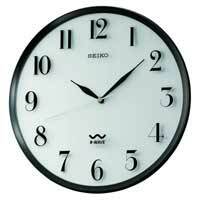 Atomic clocks are sometimes called "Radio Controlled Clocks". 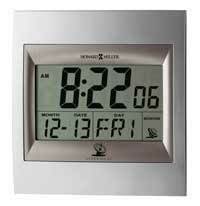 We offer both Digital Atomic Clocks with LCD displays and Analog Atomic Clocks that have hands. 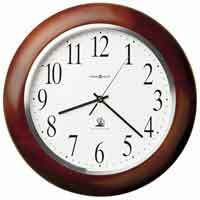 This Handsome solid wood atomic mantel clock is finished in mahogany. Radio controlled movement automatically sets to any U.S. time zone as it receives signals and also adjusts to Daylight Saving Time changes. Off white dial with black hands and hour markers. Glass crystal front protects the dial. Requires 1 AA Battery which is included. One year warranty and Free Shipping. 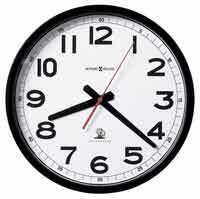 Atomic Clocks are great timekeepers.